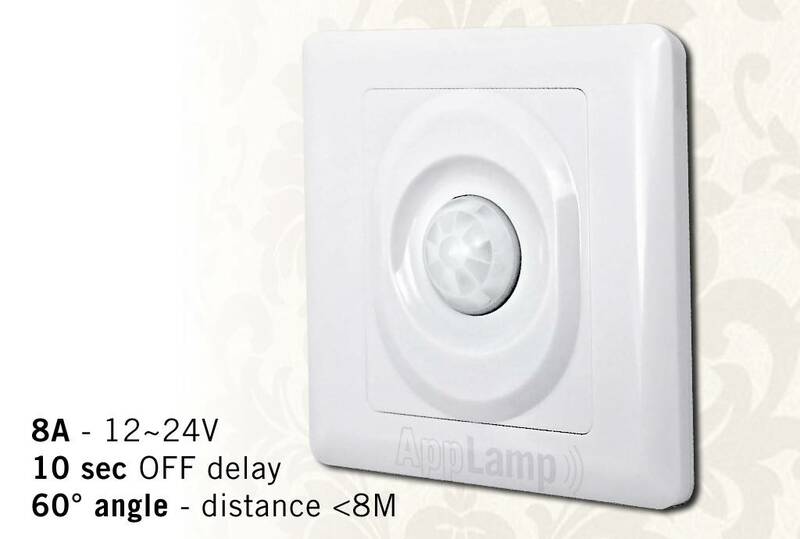 Wall mounted PIR movement sensor, 12-24V / 8A, 60° angle, 10 sec delay. Wall recessed PIR motion sensor switch for 12 to 24 Volt DC LED lighting or other applications. Off delay of 10 seconds. Infrared motion detection angle of 120 degrees and a maximum range of 8 meters. 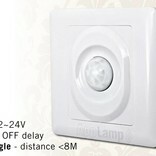 Wall mounting PIR motion / movement sensor switch for 12 to 24 Volt DC LED lighting or other applications. Off delay of 10 seconds. Infrared motion detector with detection angle of 60 degrees and a maximum detection range of 8 meters.